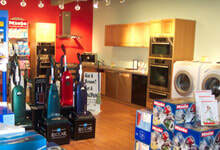 North Shore Vacuum and Appliance offers the greatest selection of vacuum cleaners Danvers MA area residents and businesses. Since 1934, we have provided top quality machines at competitive prices. Our product knowledge and expertise in all things vacuum cleaners is what keeps our customers coming back generations later. Now run by a fourth-generation owner, we continue to strive toward superb customer service and superior product knowledge. Our store is conveniently open six days each week, Monday-Saturday from 9 a.m. to 6 p.m. Our team of experts is here to answer any questions you may have about vacuum cleaners, as well as to point you in the right direction. To call ahead and schedule an appointment, dial (978) 774-1155 today. For the best variety, and for expert advice on vacuum cleaners, Danvers MA area residents can continue to trust us to provide for your needs.